Japanese high-tech firm QD Laser Inc. and the Medical Faculty of German University of Duisburg-Essen have signed an agreement for cooperation at The University of Tokyo today. 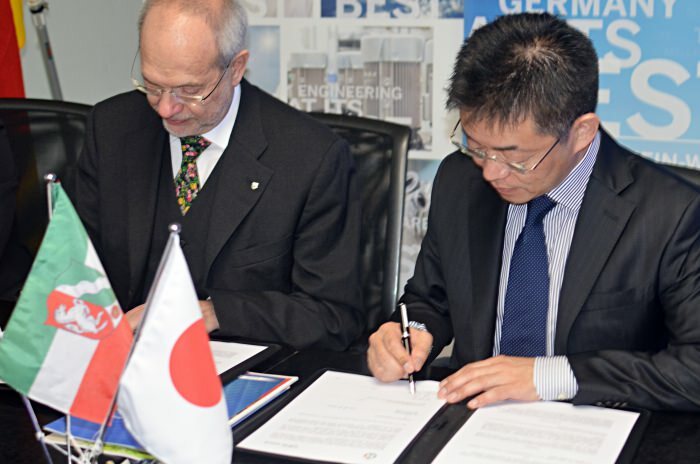 As part of the Memorandum of Understanding, the Eye Clinic of Essen University Hospital will perform clinical studies and research with the innovative retinal imaging laser eyewear (LEW) model developed by QD Laser and University of Tokyo. The LEW aims to help people with low vision to lead a more normal life again. It works through a miniature laser that draws images onto the wearer’s retina through the pupil. The studies to be conducted by Essen University Hospital aim to show that by using the device even patients with severe visual impairments can carry out everyday activities like shopping, watching television or reading a book. QD Laser’s CEO Dr. Mitsuru Sugawara said that the company plans to launch the LEW in Japan in March 2016. The technology is harmless to healthy eyes and he believes that it is possible that the LEW will be available for purchase at normal eyeglass stores within a few years from now. The clinical trials at Essen University Hospital are expected to help making the innovative visual aid also available in Europe in a timely manner. “This technology in miniature format not only represents scientific innovation, but could also soon significantly improve the sight and therefore the quality of life of patients,” said Svenja Schulze, Minister for Innovation, Science and Research of the German state of North Rhine-Westphalia at the event. Low vision is a kind of visual impairment with very low visual acuity or narrow visual field that can not be corrected with glasses. It can come from various diseases and causes. In Japan, more than 350,000 people are officially recognized as handicapped due to low vision. Beyond that, an estimated 1.5 million people are experiencing difficulties in daily life. The trend toward an aging society is expected to increase these numbers more and more. According to Prof. Wolfgang Sauerwein of the Medical Faculty of University of Duisburg-Essen, in Germany around 30 percent of people over the age of 70 have loss of central vision. “The work performed by the University Eye Clinic in Essen in this trial is an important study collecting data dealing with LEW,” he said. The cooperation is a good example how economic development agencies can add value by bringing together institutions from different countries for mutual benefit. 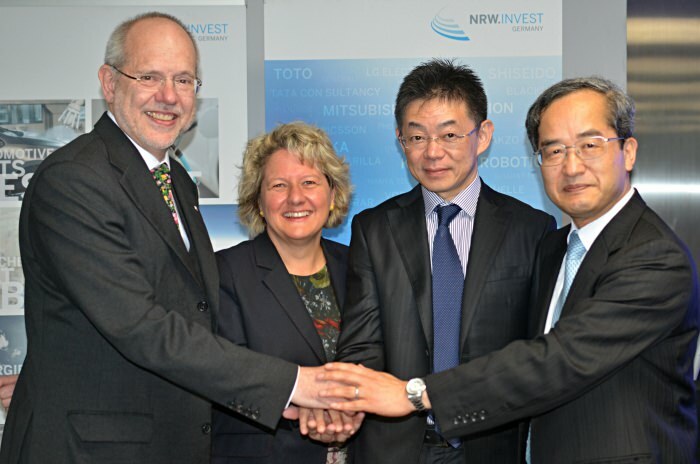 NRW Japan K.K., the Japanese arm of the economic development agency of German state of North Rhine-Westphalia, initiated first contact between the partners and supported in finding sites and bringing stakeholders together. QD Laser was founded in 2006 as a start-up with the help of a corporate fund of Fujitsu Ltd. The company develops and produces quantum dot laser devices and optical devices. It cooperates closely with the Institute for Nano Quantum Information Electronics at the University of Tokyo. The University Hospital Essen is the academic hospital of the University of Duisburg-Essen. Priority research areas of the medical faculty in Essen are cardiovascular diseases, oncology, transplantation, immunology, infection and genetic medicine. The priority research areas are joined by the University Eye Hospital with several special clinics. CEO of Bonuterra Inc. Learn more about and contact him. It’s hop for low vision patient’s.